Sudan, the last male northern white rhino on the planet, was put down today after struggling from age-related complications; his caretakers reported that Sudan had been suffering from degenerative changes in muscles and bones combined with extensive skin wounds. 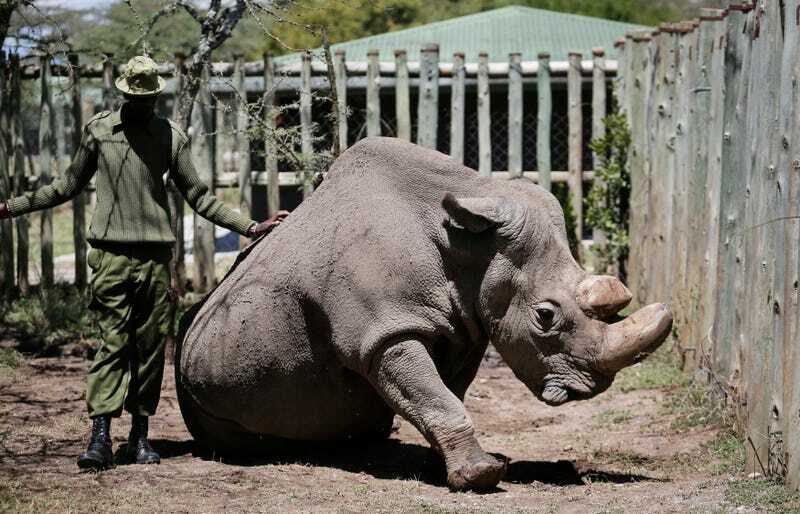 “His condition worsened significantly in the last 24 hours; he was unable to stand up and was suffering a great deal,” explained the Ol Pejeta sanctuary in Kenya, where Sudan has been kept since 2009. Now that Sudan is gone, there are just two northern white rhinos left on the planet: Najin (Sudan’s daughter) and Fatu (Sudan’s granddaughter). What was once a majestic population of ancient animals (rhinoceros can trace their ancestry back 50 million years, long before humans dominated the planet) is now a sad story that reflects the state of the natural world. All five rhino species are considered threatened, with the Sumatran and Javan rhinos teetering on the edge of extinction. But with just two individuals left (both of which are female), none is more threatened than the northern white rhino (a subspecies of the white rhino). Keeper Zachariah Mutai attends to Fatu, one of only two northern white rhinos left in the world, in the pen where she is kept for observation, at the Ol Pejeta Conservancy in Laikipia county in Kenya Friday, March 2, 2018. The only hope in preserving the northern white rhino now lies in untested in vitro fertilization techniques. “His genetic material was collected yesterday and provides a hope for future attempts at reproduction of northern white rhinos through advanced cellular technologies,” explained Sudan’s caretakers. Najin, centre, one of only two female northern white rhinos remaining in the world, graze in the pen where she is kept for observation, at the Ol Pejeta Conservancy in Laikipia county in Kenya Friday, March 2, 2018. Even as Sudan’s lineage walks towards the void, the southern white rhino offers hope for a conservation story with a different ending. More than a hundred years ago, the subspecies was hunted to the edge of extinction, numbering as low as 20 individuals. But thanks to extensive protections and breeding programs, there are now around 20,000 southern white rhinos in the wild, making them the least-endangered rhino subspecies. For Sudan and the northern subspecies, the conservation effort seems to be too little too late. Still, there’s a disturbingly long list of species that are struggling to survive for whom we can still make a difference.